An 8.2 mile scenic drive passes through the Koa'e Fault, an unusual geological feature. Brown lava flows and native plants can be found throughout this drive that ends at the Halina Pali overlook - a breathtaking ocean view from a 2000 foot cliff. 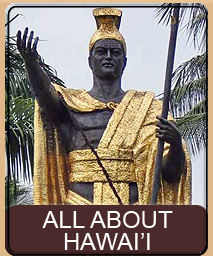 A number of interesting stops along the way offer a chance to stroll and investigate more of Hawai'i. This scenic drive is a paved road just a bit wider than a car. The speed limit on the road is 25 mph, but rarely will you be going so fast. The road has curves so be careful because you might suddenly meet oncoming vehicles. Bicycles groups sometime use this road and portions are also part of the yearly marathon run - so be aware that you might encounter bikes and pedestrians. This road is best done on a sunny day - avoid doing this road during rain - especially heavy rain, which can cause flash flooding. There is a bathroom at the 3.5 mile point in the Kulana'okuaiki Campground. There is also an outhouse at the end of the road, at Hilina Pali overlook. There is no water or any other services available along this scenic drive. You will want to bring water and perhaps a snack for this drive. To find Hilina Pali Road take Highway 11 to Volcano and enter the Hawai'i Volcanoes National Park. Once you pass the park gatehouse make the first left onto Crater Rim Drive. Continue on Crater Rim Drive 3 miles until the intersection with Chain of Craters Road. 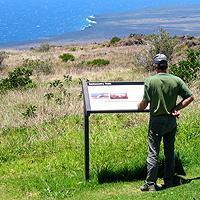 Turn left onto Chain of Craters Road and proceed approximately 2.2 miles to the Hilina Pali road. Reset the odometer on your car at this point - we are about to begin the scenic drive. Before we begin the Hilina Pali Scenic Drive you will note that just past the Hilina Pali Road is a small gravel pullout. Pull into there, park and turn off your car - we are going to start this scenic drive with a quick walk. Now that you are parked on the gravel pullout next to Hilina Pali Road, look across the paved Chain of Craters Road to the other side and you will see a small-unmarked tail. Take this trail about 50 feet until you get to Devil's Throat. Devil's Throat is one of the closest and most accessible example of a pit crater. Formed in 1912, this crater was originally over 200 feet deep, but today - due to collapse of the walls, is now about 160 feet deep. We have a review online that gives more details, pictures, and important warnings about this trail. Please click here to read the Devil's Throat review. 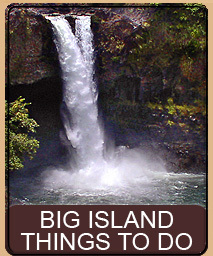 Ok, once you caught your breath from viewing Devil's Throat, it's time to start the Hilina Pali Road drive. The first mile is mostly 'Ōhi'a trees with other native underbrush. You will also see Koa trees along this part of the road, with their unusual flat curved leaves. At about the 0.9 mile point you will notice a cliff to your left. This cliff is actually the active Koa'e fault system. 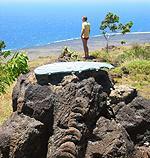 The Koa'e fault lies between the east and southwest rift zones and is about 10 miles long and 1.5 miles wide. The cliff itself varies in height anywhere form a few feet to 50 feet high along the length of the fault. 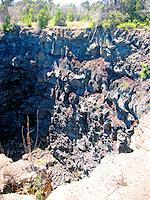 The lava in this area is about 650 years old but the most recent change in the fault itself was in late 1965. The fault is an extension of the rift zone and defines a slippage of the ground between the northern and southern parts of Kilauea. One interesting thing to note about the fault is that it appears to be a backwards or reverse fault. 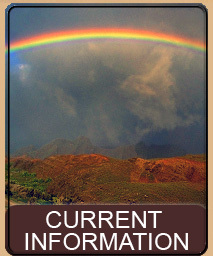 Most faults on Hawai'i slip lower towards the ocean, as if the ground is sinking into the ocean. This fault, however, is lower on the side facing away from the ocean - completely the reverse of what one would expect. 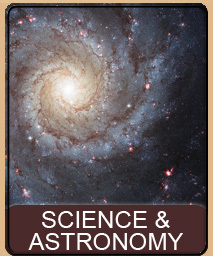 This indicates that either the higher ground rose, or the ground you are driving on sunk. While there is probably a combination of both factors - you will notice as you drive through here that you seem to be in a depression or slight bowl. This would lead one to suspect that the area you are driving through actually sank. You will notice that at about 1.3 miles the fault actually comes right up to the road. It moves back and forth as you continue driving. 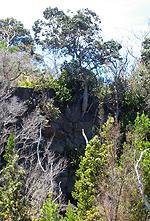 At about the 2.5 mark you will begin to see the trees thin out to brown pahoehoe lava flows. As you approach the 3.5 mile marker you will see mostly pahoehoe lava and the Koa'e Fault will be quite evident on your left. At the 3.5 mile marker you will see signs and a road to your right to the Kulana'okuaiki Campground. The Kulana'okuaiki Campground was opened on March 31, 2000. The old campground was further down the road at Kīpuka Nēnē and was closed to protect Nēnē that had begun nesting in the area. The word Kulana'okuaiki (coo-la-na oh-coo-ah-e-key) means shaking of a sharp ridge and is named for the Koa'e Fault that is so visible from the campground. 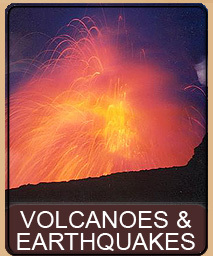 The camp itself sits between a 1,300 year old lava flow and a younger 650 year old flow. You will easily pick out the younger from the older flows by the colors and weathering. The campground is primitive at best. There are three campsites - two of which are wheelchair accessible. The campground has a paved path that goes to the various campsites each of which are 6 to 12 inch high raised concrete platforms. There are barbecue pits, emergency telephone, picnic tables and a toilet. There is no running water of any kind. Camping is first come, first serve - but it is rare for the campground to be full. The day we visited there were two visitors just looking and one local couple taking down their campsite. There is a limit to 7 consecutive days in the campground and no more than 30 days total in a year. The campground is very stark. You are surrounded by lava and it can be very windy at times. There is little shade - though there is native trees and brush around. On nice days you have a commanding view of Mauna Loa and it can be quite dramatic. As you leave Kulana'okuaiki Campgrounds you can see that the road ahead of you curves towards the Koa'e Fault and actually goes up and over the fault. At the 3.8 odometer reading you are actually at the top of the fault. There is a small parking area on the left and a larger one further down on the right. This is an interesting place to explore for a few minutes, so park and walk back towards the fault. 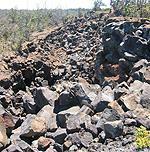 As you walk the road back towards the fault you will cross the Mauna Iki trail. The Mauna Iki trail goes from this spot on Hilina Pali road, through the Ka'ū desert and out on Highway 11 at the Footprints Trail. This trail is goes to a number of fascinating locations and spots. 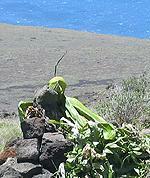 It intersects the Ka'ū Desert Trail and also goes onward to join with the Footprints Trail. Any of these hikes are all day events. If you take Mauna Iki all the way to Highway 11 (via Footprints Trail) it is 8.8 miles of hiking through a hot desert. Supplies are a must for this hike. Water, sunscreen, dark glasses, hat are all necessary. However, you will see amazing things on this trail. True deserts and sand dunes... pit craters and volcanic cones... footprints in lava where Hawaiians once stood. We will have portions of this trail reviewed shortly. Continue past the Mauna Iki trailhead to the fault. The fault at this point is pretty interesting because you can actually touch it. Huge jumbled boulders are on both sides of the road here - and the fault itself is very visible. The only plants growing here are 'Ōhi'a trees and various grasses and small ferns. Since this is starting to go into the Ka'ū desert, things are drying out more and more and the landscape reflects this. You will notice the absence of any indication of lava flowing within the fault itself. All the boulders, as well as the wall of the fault, are cleanly broken. Even though lava was flowing at the time of the earthquakes that created this fault, no lava was in the actual Koa'e Fault system. All the damage you see is completely the result of the ground shifting. As you approach 5.2 you will enter a kīpuka (key-poo-ka). A kīpuka, when used in this sense, is an area of vegetation that was surrounded by lava. Each kīpuka became an oasis and safe haven for the plants that lived there, while all the plants around the kīpuka died. Kīpuka Nēnē use to be the official campground on Hilina Pali road. When you arrive at the kīpuka you will see a bright red fire shed on the right of the road, and on the left just behind a small hill is a small pavilion. We couldn't resist the urge to check out the fire shed, and upon opening it found it to contain picks and shovels for firefighting. This area, being part of the Ka'ū desert, is especially dry and prone to fires from careless people. The pavilion and surrounding grassy area are all currently off limits due to the potential of nesting Nēnē birds. 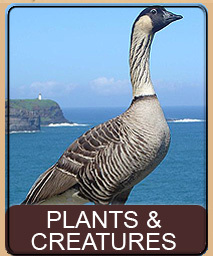 The Nēnē is, of course, the state bird and is also an endangered species. They nest on the ground in the brush and scrub. Once the Nēnē started using the area the campground was shifted to Kulana'okuaiki to protect the Nēnē. There are abundant native plants and small brush in this area that the birds would find perfect for nesting. However, from the vantage point of the road we could not see any nests or birds during this visit. You can also find the Māmane Tree growing here. 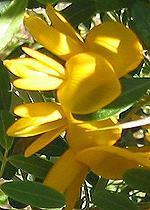 It has bright yellow flowers and a strange long seedpod that is a food source for the endangered Pilila bird. As we leave Kīpuka Nēnē we enter an area there are a variety of smooth brown and tan lava flows with intermittent 'Ōhi'a trees. At mile 5.4 you will pass a trail on the left. This trail used to start at Kīpuka Nēnē and went down to the Inahou Ranch, but when the campground was moved the trail was also moved to this point. This is a popular horse and mountain biking trail. Continuing on, at 6.4 mile marker you may notice a weather station off the road at the curve. For the scientifically curious you can park on the pull off at the curve and walk the short trail to the weather station. This is a remote monitoring station that collects wind, temperature and rain information and sends it by radio to the volcano observatory. The station is solar powered. As you drive you will get glimpses from time to time of the ocean, far below and away, but your first really good view starts at about 7.2 miles, and keeps getting better. You will notice that in this area there are also flood planes set into the road. These are for occasional flash floods that happen in this area. At 8.6 miles you reach the end of Hilina Pali road. There is a small parking area and pavilion as well as an outhouse behind the pavilion. You will also notice a metal hitching post used by horse riders who frequent the area. Time to get out of the car. This is the real treat of this drive. The view from here is astonishing. The 1958 geomarker says that this is 2,282 feet above sea level. Stretched out below you is part of the Ka'ū desert, ending in the sparkling turquoise blue ocean. You are on the edge of Hilina Pali. The pali (cliff) is formed by the settling of the mountainside causing a sharp cliff to be formed. Hilina Pali is over 12 miles long. You will notice two trails going down the pali in front of the pavilion, and one trail going off to the right of the pavilion (as you face the ocean). These are a part of the extensive trail system that begins here and ends at a variety of different locations. All these trails are extensive multi-day hikes and need to be carefully prepared for. Take the left most trail that descends the pali, about 20 or 30 feet, to a stone monument with the metal half circle at the top. This is a place name indicator and you can find these in a couple of places in the park such as Pu'u Huluhulu. Each half-disk has arrows extending from you (the center) off in different directions. Each arrow is labeled with what the arrow is pointing at. From left to right, clockwise, this reads: Puna, Amua Point, Pu'u Ka Pukapu, Kalue, South, and Ka'ū at the very right. Just a few feet below the monument is another pile of stones, often with a Hawaiian gift on it. These stones are to remember the people who were killed when a portion of Hilina Pali suddenly dropped into the ocean causing a 7.2 magnitude earthquake. The resulting oceanfront earthquake created a 48 foot tsunami which killed two people and injured 19 others. "Hilina Pali overlooks a sweeping vista of the costal wilderness, inviting hikers to enter the heart of the park's backcountry. To the south, the Hilina Pali Trail leads to several coastal sites, most notably Ka'aha. 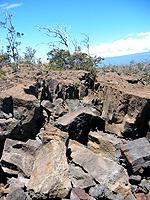 The shade less trail zigzags down a sheer 1,400 foot pali and crosses lava flows and windswept grasslands. To the west, the Ka'ū Desert Trail skirts the edge of a starkly beautiful desert landscape, passing through grasslands and scattered groves of 'Ōhi'a trees on the way to Pepeiao. From there the choices are north through the desert, or south to the sea." 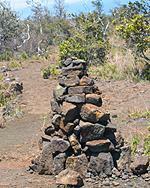 The trails are marked by stone cairns called ahu which are cone shaped piles of lava rocks about knee to waist high. There is a cabin at Pepeiao that has 3 beds and catchment water (non-drinkable) and a pit toilet. There is also a 3-walled shelter at Ka'aha, undrinkable catchment and a pit toilet. These are not simple trails - they take over a day and you should register with the park if you intend to do one of these hikes. To return home, simply go back the way you came in. Hilina Pali is a one-way trip so you won't get lost leaving! Do be careful of oncoming traffic going out, as the road can be popular, especially on weekends. This page is named 'Drives.hilina'. Can't Find It?